Vertical/Horizontal Vibration Combined Enviromental Test System - DAINAN TECH (S) PTE. LTD. The Vertical/Horizontal Vibration Combined Environmental Test System is a chamber located above the vibration test system, which is equipped with a vertical and horizontal table in front of and behind the vibration test equipment, to allow the chamber to slide and move up and down to perform vertical excitation combined testing and conventional horizontal excitation combined testing at ambient temperature in a single unit. The vertical and horizontal tables are separated, enabling large displacement and high speed vibration, which is ideal for combined environmental testing of automotive parts, car electronics, wire harnesses, plastic molded parts, and more. Features a maximum displacement of 51 mmp-p, a maximum velocity of 2.0 m/s, and a maximum acceleration of 1250 m/s2. This model enables large displacement and high speed vibration testing, which cannot be achieved with a multi-axis vibration test system. * Maximum performance depends on the excitation device type. 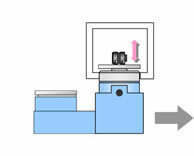 In combined environmental testing, the temperature and humidity chamber and vibration test system operate sequentially, but each function can also be operated independently. This model enables temperature characteristic testing with the temperature and humidity chamber and vibration testing at ambient temperature. 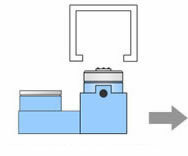 A custom excitation jig to secure samples is available. Contact us for details. The specimen and vertical auxiliary table are removed, and the vibration device and chamber are separated. 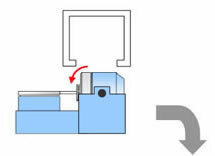 The excitation device is lowered 90 degrees, and the horizontal vibration table is connected using a connecting jig. The specimen is set, and the horizontal vibration table and chamber are docked. The specimen is rotated 90 degrees. * The model is for operational purposes and may be changed after order.